Salmon filets, cut into 6 oz. portions 4 ea. Lemons, peeled, thinly sliced 2 ea. Shallots, thinly sliced 4 Tbsp. Red bliss potatoes, cooked, thinly sliced 1 lb. Brush parchment paper with olive oil. Arrange 3/4 cup of sliced potatoes on parchment paper, and place one portion of salmon on top of the potatoes. Season the salmon with salt and pepper, top each portion with 2 lemon slices, 1/4 cup of celery, 1 Tbsp. of shallots, and 1 Tbsp. of herbs. Sprinkle some white wine onto each salmon piece. 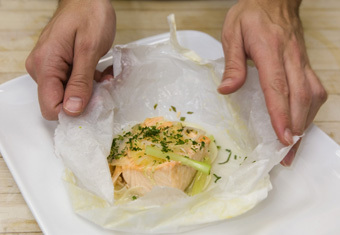 Fold the paper over the top of the salmon to create a pouch and crimp the paper edges to seal. Microwave 2 pieces at a time on P10 for 3-1/2 minutes, until the paper pouch puffs up. Serve the salmon in the paper and slit in the pouch open with scissors or a pairing knife.